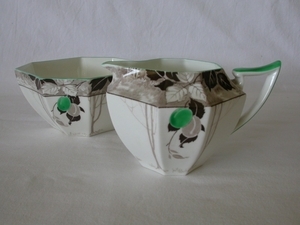 A beautiful vintage creamer and sugar bowl�(tea sized in the Queen Ann shape) by Shelley in the Green Damsons pattern (11833) which was entered into the pattern book during or after 1931.� The backstamp on this particular piece was used between 1925 and 1940. They are in excellent condition, having no repairs,�chips, cracks or stains, and have no crazing which is unusual for�a piece of this age. Both pieces ping in the typical "Shelley" fashion guaranteeing that they are in perfect condition.� The green trim is in excellent condition.